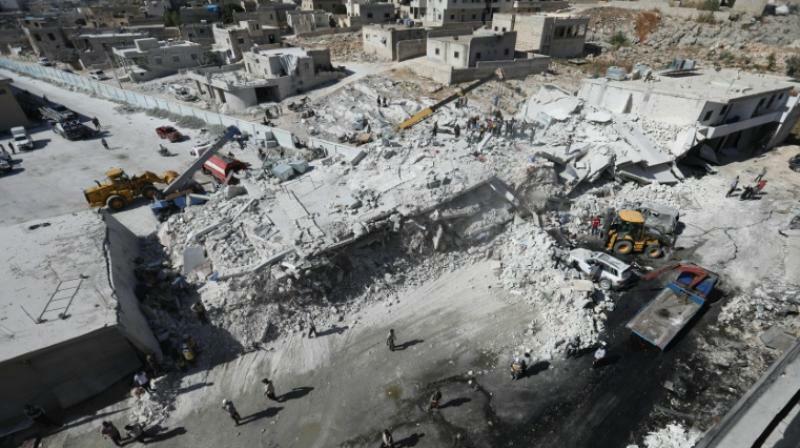 An AFP correspondent at the site in Sarmada in Idlib province near the Turkish border said the explosion of unknown origin caused two buildings to collapse. Rescue workers used a bulldozer to remove rubble and extract trapped people, the correspondent said. "The explosion occurred in a weapons depot in a residential building in Sarmada," said the head of the Britain-based monitor, which relies on a network of sources inside Syria. But the cause of the blast was "not yet clear", Abdel Rahman added. He said most of those killed were family members of fighters from Hayat Tahrir al-Sham, an alliance led by jihadists from Syria's former Al-Qaeda affiliate, who had been displaced to the area from the central province of Homs. A rescue worker carried the motionless body of a small child from the wreckage to an ambulance, the AFP correspondent said. Behind mounds of rubble, the facade of a building was scorched black, due to a fire after the blast. A civil defence source told AFP that women and children were among the dead. But rescue workers had pulled out "five people who were still alive", the source said. Most of Idlib is controlled by rebels and Hayat Tahrir al-Sham, but the Islamic State group also has sleeper cells in the area. Around 2.5 million people live in the province, half of them displaced by fighting in other parts of the country. More than 350,000 people have been killed and millions displaced since Syria's civil war started in 2011 with the brutal repression of anti-government protests.